Sparrow! The Junk Man! Marla the Egg Woman! 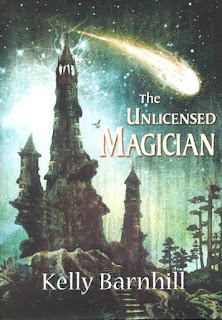 One thing I wondered about The Unlicensed Magician only after I finished reading the book and my heart finished soaring, is if the title of the book is "The Unlicensed Magician" - are there actually licensed magicians? This is not a question Kelly Barnhill elects to answer in her novella, unless the answer is "well, the Minister, obviously," but this is also a question that one probably doesn't need to dwell on for very long. What we should dwell on is the story of Sparrow, a teenaged girl who almost nobody in the world can actually see or remember unless she chooses to let that person see. Even then, they are unlikely to remember, but that's a good thing because Sparrow is magic and in this world, magic is forbidden. If you've read any of Kelly Barnhill's previous fiction like her YA novel Iron Hearted Violet or her short story "Mrs. Sorensen and the Sasquatch", you have come to expect a certain amount of charm all wrapped up in a fantastically well told story and The Unlicensed Magician has both in spades. The most important characters all have names like Sparrow, The Junk Man, Marla the Egg Woman, The Constable, and The Minister. Their names are easy descriptions, but they're not facile. There is remarkable and painful depth to each of these characters. That bit with The Minister acquiring and draining the magical children, it's been going on for a long, long time and there are some far reaching consequences that range from the structural in the city down to the oh so deeply personal. Barnhill doles out the personal histories in small bites, but each one resonates and each one hurts. Some things you just don't get over. The Unlicensed Magician is a smoothly affecting novella told in alternating chapters of the present day with Sparrow and her looming confrontation with the Minister (not a spoiler, this is so obviously the storyline from the start) and the past with The Junk Man finding a living dead baby on a pile of trash. 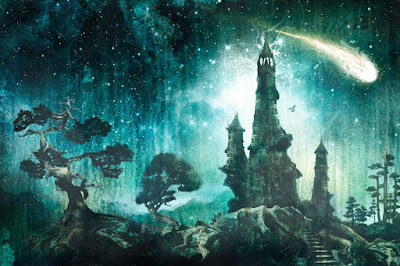 Barnhill compels the reader to smile through the heartbreak, cheer for bold heroism and defiance, and celebrate victories which come with a heavy cost. The Unlicensed Magician is a delight and a treasure. Before we close, let's take one more look at Ben Baldwin's full wraparound art because, well, just look at it. Bonuses: + for how perfectly drawn each of the characters are. Penalties: -1 because sometimes the prose is a touch on the spare side.